Mount Road or Anna Salai as it is popularly called is one of the landmarks of Chennai city. Starting from the Cooum Creek, south of Fort St George and ending at the Kathipara Junction in Guindy, the area has become a real estate hot spot thanks to the infrastructure development all around. 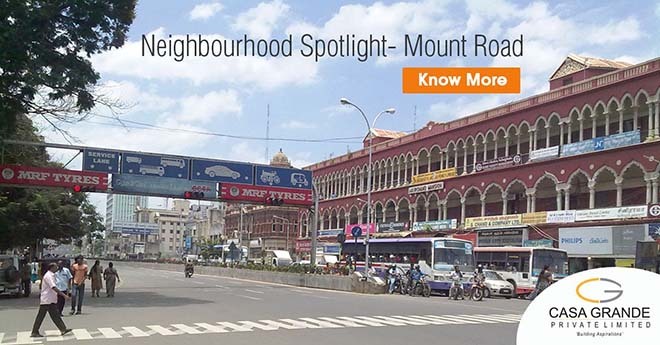 Being at the heart of the city, Mount Road is also well connected to other major areas of Chennai such as T.Nagar, Kotturpuram and Alwarpet etc. Since its inception, Sacred Heart Matriculation Higher Secondary School has focused on fostering critical thinking in students. The school is one of the most reputed schools in Chennai and is well-equipped with the latest technology and is open to admission for students from LKG to class 12. The University of Madras was established in 1857 and is one of the most premium universities in India. The university has 73 academic departments grouped under 18 schools and covers diverse areas such as sciences, social sciences, humanities, management and medicine along with 109 affiliated colleges and 52 approved research institutions. Ethiraj College for Women was started in 1948 by Shri. V.L. Ethiraj, an eminent lawyer and renowned philanthropist. Established with the vision of providing high quality education and empowering women, the college is an arts and science college with 6500 students. DAV schools are one of the most sought after schools among Chennai parents. Every year, the school produces some of the top ranked students and seeks to empower children with excellence in education while focusing on attitude and character. A leading vegetarian restaurant in the city, Annalakshmi is a perfect restaurant to visit with your family. It is a temple themed restaurant that offers high quality South Indian and North Indian cuisines. With great food and ambiance, it is a perfect place to get authentic food and great service. Peshawri is an upscale restaurant situated in ITC Grand Chola serving authentic North Indian food. It is known for its rustic flavors brought alive in simple elegance. While the food is to die for, the ambiance is something one cannot miss as well. If you are craving for some authentic Hyderabadi Biriyani, then Asife Biriyani Center is a must visit. With various types of biriyanis and quick service at affordable costs, this restaurant is certainly a one to explore. A rooftop restaurant at Taj Club House, Kefi is a perfect choice for a romantic night out. The restaurant serves mouth watering pan Mediterranean and Greek dishes. The ambiance of the restaurant is top notch and is highly recommended if you want to sit back and unwind. If you have been looking for some authentic Italian cuisine, Ottimo Cucina Italiana should be your go to option. Located inside the ITC Grand Chola, it is an upscale restaurant that is famous for wood fired pizzas, elaborate antipasto and an astonishing variety of artisanal pastas and cheeses, not to mention grappa at the exclusive grappa bar and select wines from the wine anoteca. One of the best hospitals for maternity and pregnancy care, Cloudnine hospital is headquartered in Bangalore and has a branch in Chennai, Mumbai, Pune and Gurgaon as well. The hospital boasts of more than 30,000 deliveries till date and also provides Gynecology, Pediatrics, Intensive Care, Fertility and Neonatal Care services. Sri Balaji Hospitals was established in 1981and is currently one of the leading multi specialty hospitals in Chennai. A pioneer in Orthopaedics and Traumatology, the hospital has state-of-the-art Intensive Care Unit, equipped with the world’s finest ventilators, transport ventilators, space lab monitors and round the clock laboratory services, CT-scan and X-ray facilities. Oxymed Hospital is one of the best multi specialty hospitals in Chennai. The hospital is known for its non-surgical cardiology treatment for cardiovascular diseases and other diseases such as Parkinson’s disease, diabetic gangrene and foot ulcers, stroke and paralysis, erectile dysfunction, osteoarthritis, chronic fatigue syndrome and cancer among othersat an affordable cost. Established by the government of Tamil Nadu, the hospital is a 400-bed super-specialty hospital in Chennai. It was started in 2014 as a referral hospital, similar to the All India Institute of Medical Sciences (AIIMS) in New Delhi. Casagrand Monte Carlo–Casagrand Monte Carlo, placed ideally along the Mount Road belt, is the perfect haven for those that find peace in the heart of this happening city. Globus is a chain of stores that has clothes and accessories for both men and women. It is part of the Rajan Raheja Group and is one of the leading fashion brands not just in Chennai but also in other parts on India. Croma is a one stop destination for all your electronic and home appliances needs. It is owned by the Tata Group and offers more than over 6000 products across eight categories in a world-class ambience. Express AvenueMall is one of the biggest shopping malls in Chennai. It is home to some of the big brands such as Hidesign, Pantaloons, Big Bazaar, Marks & Spencers etc. The mall houses food court that has 25 counters and includes food chains such as KFC and Pizza Hut. If you are looking for sophisticated yet chic Indian clothing, then Fab India is a perfect option for you. It is one of India’s best retail stores for products that are made from traditional techniques, skills and hand-based processes. It is believed that the business activities of Mount Road were responsible for the city’s economic growth. Several giant firms had the beginnings on Mount Road, from the Amalgamations group to the TVS group were set up here. Here is a look at some of the top landmarks of Mount Road. Ashok Leyland is an Indian automobile company and is the second largest commercial vehicle manufacturer in India. It sells about 60,000 vehicles and about 7,000 engines annually. The company is the market leader in the bus segment and claims to be carrying around 60 million passengers a day. A 15 storied building, LIC is the first skyscraper to be built in India. It serves as the southern regional headquarters of Life Insurance Corporation of India. It was the tallest building in Chennai and until recently and still is one of the landmarks of the city. The Hindu is one of the oldest newspapers and is the second most circulated English language daily in India. The company employs over 1,600 workers and annual turnover reached almost $200 million. A mall located on Mount Road, it is one of the new age landmarks of the city. The mall was first built during the British Raj and was later rebuilt in 1985 and is the oldest shopping mall in India. Apart from shopping, the mall is also home to many offices as well. An 11-storied building located on Mount Road, Raheja Towers has a total built-up area of 399,000 sq ft. It houses companies such as Cisco, HDFC Bank, NTrust Infotech, and Bajaj Finserv to name a few. Apart from this, Mount road is also home to different companies from different sectors such as IT, Healthcare, Automobile, Finance/Accounts etc.The head offices of many commercial enterprises and public buildings are located along Anna Salai.